Sometimes you just want to say nothing. And that is the time when you can where this shirt. Of course you can also wear it to show your boss that you are not putting any comments in the code you are writing. 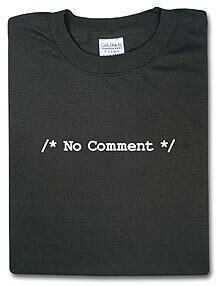 Check out this cool No Comment T-Shirt..
Next Next post: OMG I Graduated!